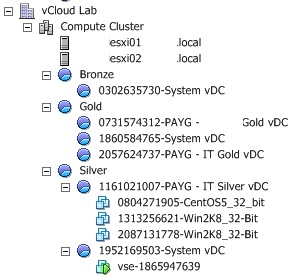 vCloud Allocation Models, vCenter Resource Pools, and Per VM Resource Settings, Say What? Why Do I Care About This Topic? Maybe you don’t, but if you are like some folks I have talked to in the past few months there is some level of confusion on the relationship between Allocation Models in vCloud Director and the vSphere Resource Pools that get created. I have found myself discussing this relationship more and more especially with customers that have not traditionally used vSphere resource pools. In turn understanding this combined with in depth knowledge of how vSphere resource pool settings affect the system could make you better understand how it all fits together. I have found that by relating the two subjects in discussions that people are more in tuned to what is going on inside the HA/DRS cluster hosting the resources and they are in a better position to manage the system. There has been a few posts out there I would like to start by referrencing if you have not seen them that explain what the Allocation models in vCloud Director are and some of the impacts as listed below. The first touches on the definition of these models and the second is a short blog by my friend and colleuge about the shares you can also set. The last one is a very similar post by Yellow-Bricks written before mine, and I admit I never saw or read it before I wrote up mine. Something I always find myself explaining to customers is how each model is translated to vCenter either as a resource pool OR directly on the Virtual Machines themselves with either a reservation, limit or neither. We often here customers using vSphere say they do not use resource pools for various reasons which I will not go into. However when you use vCloud Director EVERYTHING is translated to a resource pool as you can see below. In turn you also have certain resource constraints added to those pools or onto the Virtual Machines based on the Allocation Model. This also affects the possiby billing and chargeback calculations becuase vCenter Chargeback is also tied to these allocation models. Let’s take a look first at the allocation model and then show how the settings chosen for the model translate to the vCenter Resource settings. From there some things may come to light, not the least of which will be your almost instant need to purchase and read the latest DRS/HA book that was written. Why? Because you will start to ask yourself how does all of this affect my HA admission controls and DRS based on everything going on. I like to start with the two polar opposite models and then discuss the one that meets in the middle. This is a great example of why having your own vCloud in a Box lab is just so important.